When Faith Scheidemantle gave her acceptance speech after being named 2018’s Outstanding Graduate, she had a group of people to which her remarks were dedicated. But it was one person in particular this message applied to – her sister, Grace. “She’s always been there for me,” Faith says. 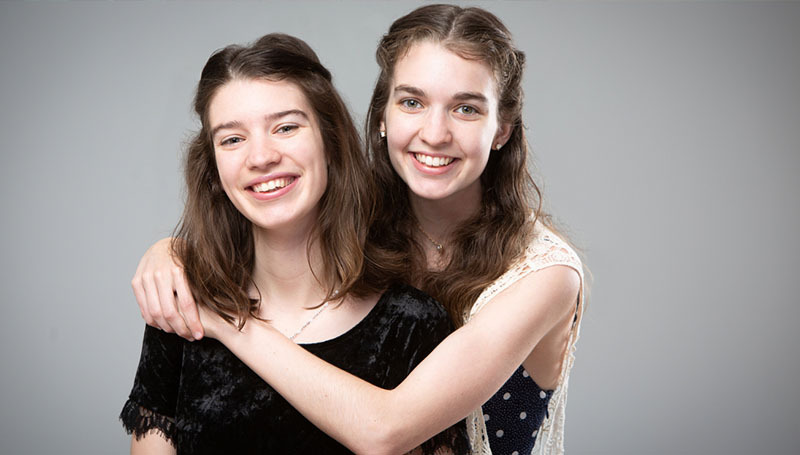 Though two years apart in age – Faith is 20, while Grace is 22 – the sisters from Camdenton, Mo., will graduate together from Missouri Southern during commencement ceremonies on Saturday, May 12. Grace, a biochemistry major, says she chose to attend MSSU based on the science and Honors programs. Being away from her younger sister – with whom she’s always been very close – felt strange, she says. Though Faith eventually followed her sister to Missouri Southern with the idea of studying elementary education, she says she found her “home away from home” in the English Department. She majored in English with a focus on professional and technical writing. While she maintained a significant course load from start to finish, it wasn’t her original plan to graduate in just three years. Their paths as Lions shared many of the same paw prints. They served as Lion Ambassadors, attended Campus Activities Board events and were each inducted into Omicron Delta Kappa, the national leadership honor society. They also both completed their courses of study through the university’s Honors Program. Even when apart, their activities and interests haven’t diverged much over the last few years. Grace serves as president of the Chemistry Club, while Faith is the former president of Sigma Tau Delta, the English honors society. Each took advantage of opportunities to study abroad while at MSSU. Grace spent a semester in England studying at the University of Bradford. Faith visited England last year during a trip offered by the English Department and this spring traveled to Paris as part of the International Media Seminar. Following nominations from departments across campus and a selection process by the Alumni Board of Directors, Faith was named 2018’s Outstanding Graduate. It’s an honor she doesn’t take lightly. Because the sisters live together and have helped each other along the way, Grace jokes that she has a stake in the award as well. “I feel like we shared it,” she says. With graduation behind them, the Scheidemantle sisters will soon be going their separate ways to continue their studies. Faith will be attending the University of Kansas to join a five-year track for composition and rhetoric and get her Ph.D. Grace will attend North Carolina State University to focus on molecular and structural biochemistry. Each says the other was her biggest supporter during their time at Missouri Southern.